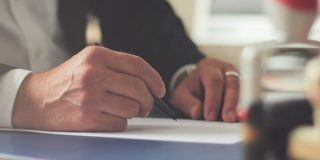 One of the worst things about marketing — aside from the endless supply of ill-fitting t-shirts at conferences — is the pressure to keep up with new trends, even if you don’t understand how they benefit your business or its customers. 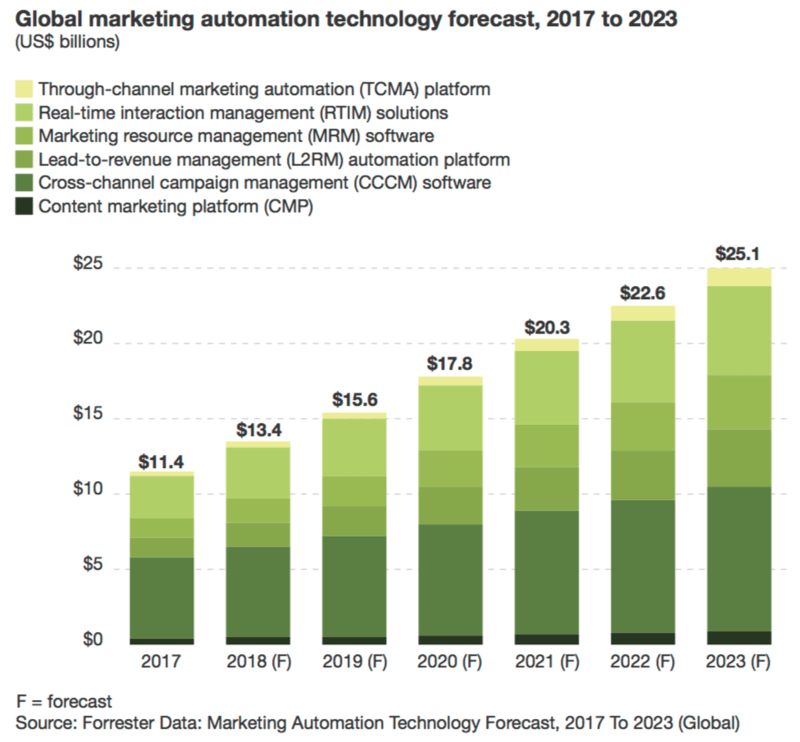 Basically: marketers know automation is important and plan to spend more money on it very soon… but they don’t know how to create a strategy around it. If this sounds familiar, don’t panic. Developing an automation strategy isn’t easy, but it is worthwhile. By asking yourself the right questions about who you want to reach and what you want to provide before, during, and after the decision-making process, you can get a strategy in place that will put those expensive automation platforms to work and start making a dent in your ROI. Let’s start working on your own strategy by clearing the air about what you should be using automation tools for in the first place. While automating your marketing definitely tends to bring in positive results, it’s not meant to replace traditional marketing tools or campaigns. It won’t replace your seasonal emails, write content for you, or intervene when you need a human touch from sales or customer service. Deliver messages to website visitors, leads, or customers at critical points before, during, or after the purchasing process. Provide crucial information to these same individuals. Automate check-ins, follow-ups, or reminders you might otherwise have to delegate to customer service or sales teams. 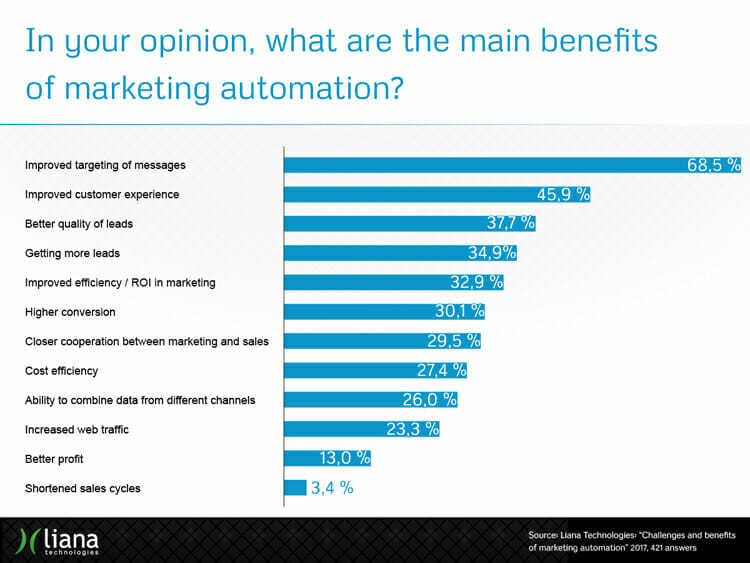 A survey by Liana Technologies showed that most marketing professionals recognize the top benefits of automation as exactly this: improving message targeting, making the experience better, and bringing in more qualified leads. 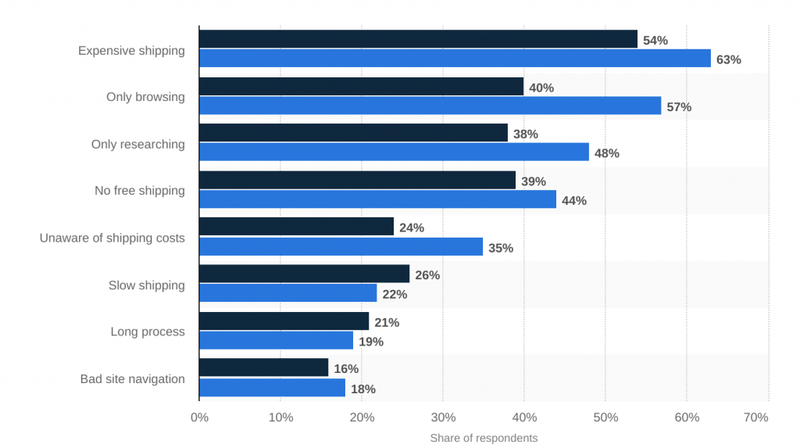 In short, marketing automation is best used as a way to deliver the right messages to the right people before, during, and after they’ve converted into a customer. And it’s this idea that you should keep in mind while deciding what to automate. There are some marketing tasks that absolutely make sense to automate. The logic on these emails can be created quickly. They can also be ridiculously successful with the right subject lines, offers, and timing. It’s no wonder they’re so popular. But you can also use email automation to add a lot more value to the overall experience your customers have with your product or service, not just to ask them for something. This may come by way of sending reminders, post-purchase education, or simple “happy birthday” messages. I’ll show you a few examples of messages like these in just a bit. Beyond email, you should think about automation for anything your business uses to interact with customers in a highly repeatable manner. For your business, that might be direct mail coupons sent after someone buys a specific product they’re likely to want again. Or maybe it’s an automated telephone call reminding them to vote for your candidate in an upcoming election. Maybe it’s more advanced scoring of leads, and passing that information to a member of the sales team so they can follow up. 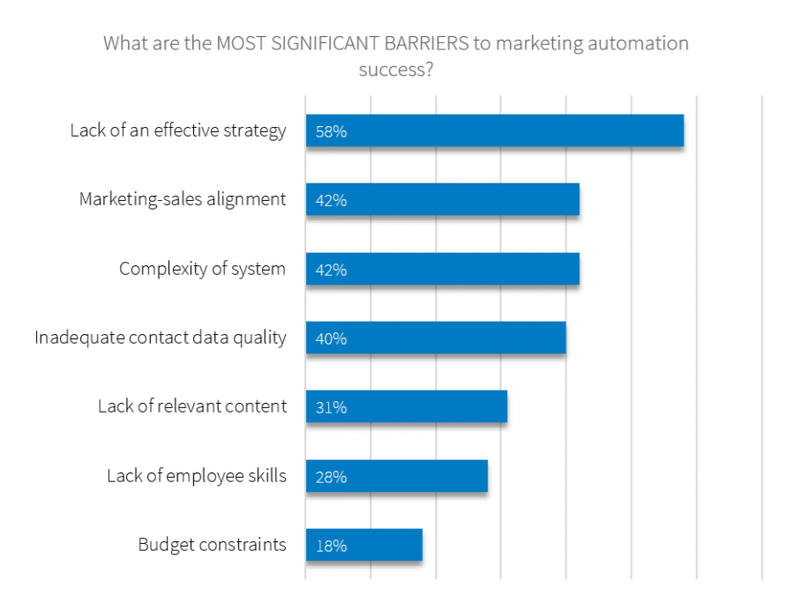 Basically, if it’s predictable and repeatable, marketing automation can handle it. On the other hand, if it’s not predictable — like a human being — or repeatable — like interactions with human beings — don’t automate it. For example: if you manufacture cell phone accessories and use your Twitter account for customer service, an automated response to every mention of “thanks for your tweet, we’ll reply soon!” would work up until the moment someone claims their device caught fire. Another consideration: with the added rules of the General Data Protection Regulation (GDPR) in the EU, you can potentially get your business into hot water by sending unexpected — and let’s face it, unwanted — sales messages to visitors who have never contacted you or explicitly opted in to communication. So be careful about scoring and contacting leads who haven’t ticked a “I’m interested in hearing from you” box. They may show promise, but citizens of the EU now have to give explicit consent to allowing such communication. It’s time to start thinking about the kind of strategy you want to develop for your business. Automation sent post-conversion to check in on the experience, offer guidance, provide links to information, or encourage repeat purchases. As you keep reading, you’ll see examples of automation from each of these three groups. They show how real businesses have automated touch points with their leads or customers to increase sales, help lessen the load on their support team, or provide a better experience. 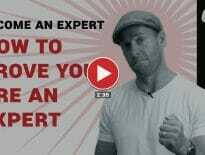 The following examples are meant to provide you with ideas for your own strategy. Depending on your business size or model, some of these examples may not be practical. But they will hopefully get you thinking about what you’re currently automating and when, and the immediate opportunities you can take advantage of. Before a conversion takes place, automation can be used in a few ways to make potential leads or purchasers aware of who you are, what you’re offering, and why you’re better than the competition. Although automation may not seem as useful at this early stage compared to its place during the actual decision-making process (which is where abandoned cart emails, one common form, show up), there are still plenty of time-saving opportunities here to explore. Early on in the decision-making process, potential customers want to learn more about you. Similarly, you want to know more about them… and probably want to find some way to get their email address so you can take the conversation past your landing page or blog post. 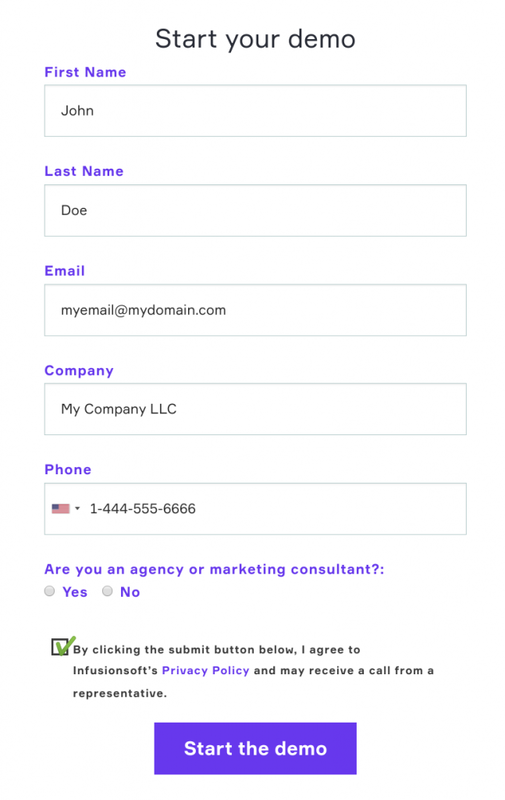 If the visitor chooses the “Online demo” option, they’re asked to fill out a form with their contact information first. … then following up with a message from a sales representative within five minutes. The biggest win for a potential lead is the ability to view a demo on their on time, at their own pace, by choosing the online option. But for this company, they win by automating follow-ups to the demo. This way, it doesn’t matter when someone is learning about their service — they can stay in touch with them at any time, and immediately put messages in their inbox that keep the lead engaged and interested in finding out more from a sales rep.
Social media automation can be helpful some tools can help you flag groups of people talking about a specific subject related to your business — for example, a product that’s highly desired, or a service you offer that folks may not even know exists. 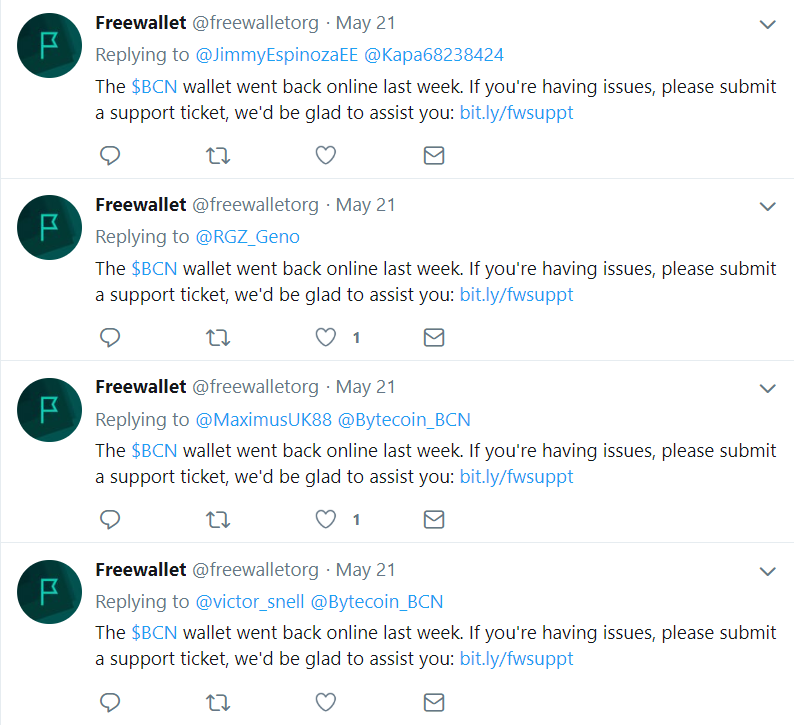 In this case, Freewallet — a cryptocurrency mobile app — collected the Twitter handles of everyone who tweeted about a specific feature being unavailable. Then, when the feature returned, they used automation to send a message about its availability to the users. In this case, the users likely had some level of awareness of Freewallet’s service or the feature that was unavailable. But it would be very easy to monitor for users saying “I wish I had x” or “why can’t I find y” and automating responses directing them to what you offer. As a general note, it would probably be more desirable to send individual messages (one message per user) instead of batches (one message per multiple users) as shown here. That way your customers won’t feel like they’re on the receiving end of communication from a robot. For those instances where dozens or even hundreds of people are asking the same question about the same subject, you can respond quickly with the right tool and a carefully crafted message. But tread carefully, and when in doubt about looking like a human, ask an expert for advice. There is really no better audience than a captive one. Especially in this new era of GDPR. If you’ve already done the legwork to educate a visitor about your company, automation can now play a pivotal role in convincing them to convert. It’s at this stage that you’ll see common options like cart abandonment emails… but there are also a few new ideas you may want to explore. If someone opts in to your email list because they’re legitimately interested, these are the first people you should be sending automated campaigns to. If you’re not already sending messages to people who have explicitly said “I like you and what you do and I want to hear from you,” that is a gap you should be filing with automation. 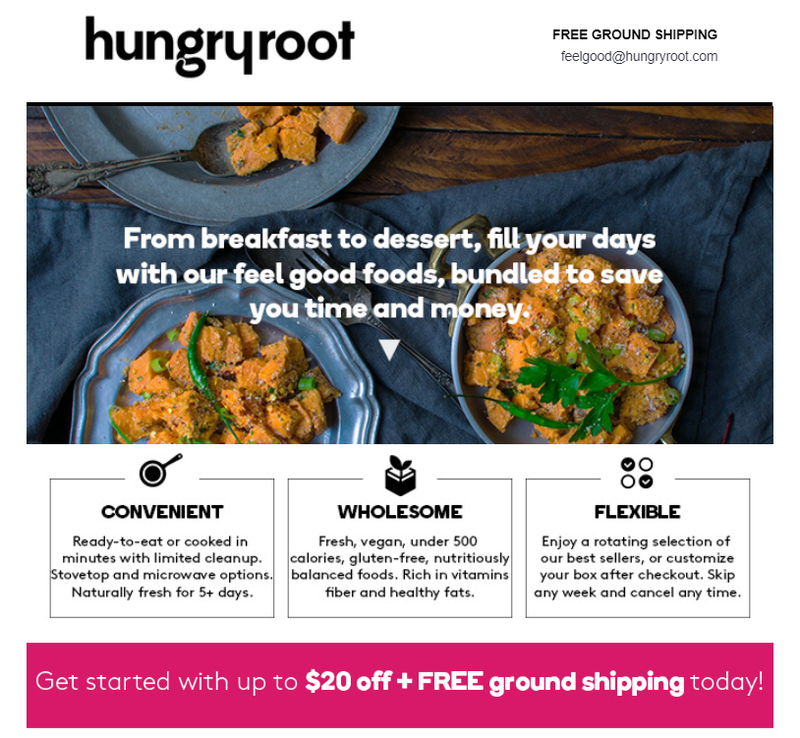 Hungryroot recently did a really good job of making me, well, hungry. I see a meal kit as a big lifestyle change, so I’ve been going back and forth on it for an embarrassingly long time. While I’ve been weighing my options, they took the liberty of sending me increasingly delicious-looking recipes and offers. It’s hard to say no to $20 off, free shipping, and curry. It’s also worth noting that these pre-sales emails all arrived around 11 AM, around the time I start to think about lunch. Clever. If you have qualified leads, automation like this can help you close the sale. Coupons or other increasingly better offers are hard to ignore, especially if a lead is already interested in making a purchase, which is why this campaign works so well. If you’re willing to do something to combat these causes of abandonment, like offering a coupon code, automation can help you reach these potential customers quickly, and potentially bring back a substantial amount of revenue you might have otherwise lost. A Brand Growth Experts client who implemented abandoned cart emails found that this was a highly profitable form of automation. Their automation includes an email reminding the potential customer that they left something in their cart, and then sends messages offering a percentage off their purchase as an incentive to finish the transaction. In July 2017, the month this automation was established, the abandoned cart flow brought in $5990. By the next month, revenue from the flow had nearly tripled, bringing in $14,923. As of April 2018, the abandoned cart messages brought in $24,417 (an increase of 64%). This particular client has continued to see this rate of success month over month. It’s also worth noting that the first email in this automated campaign has a 39% open rate and a 4.6% conversion rate, while a typical (non-automated) campaign for this client has an open rate of around 18% and drives about $3000 in revenue. For this particular client, automated flows are opened significantly more, and bring in more revenue. This includes both the abandoned cart messaging described above, as well as a welcome campaign sent to new email subscribers. The amount of additional revenue that this Brand Growth Experts client was able to add with two automations, including a series of abandoned cart emails, is substantial — and it’s still growing. As your other marketing activities attract more leads, subscribers, or potential customers, these automations also have the potential to grow and generate more revenue, just as they have for this client. There’s a lot to be said about automating messages after the sale. Post-purchase automation may not seem as worthwhile because, well, you already have their money. But automation can be incredibly useful here. Here are some examples of how automation can help keep current customers happy with you, and potentially even encourage them to come back to you again. 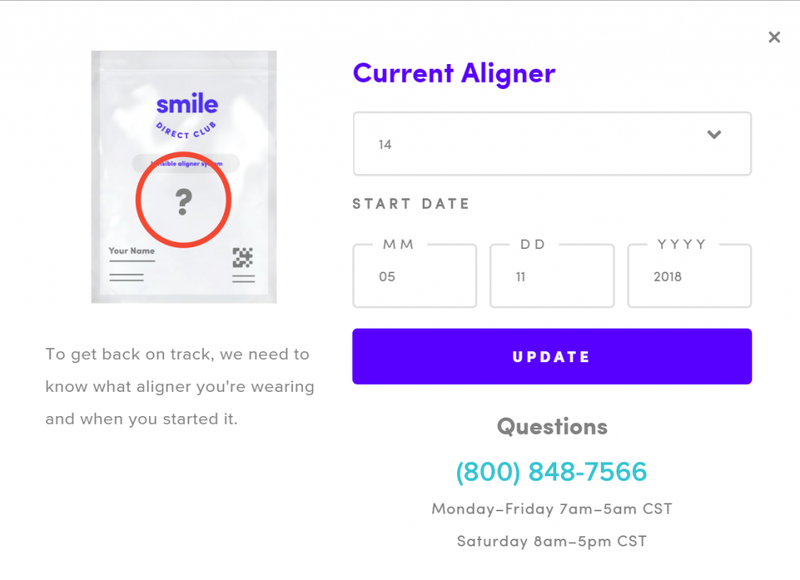 SmileDirectClub does one of the best jobs I’ve seen with post-purchase automation, which in their case is designed to reduce the amount of support needed from customer service. Their automation comes in the form of very carefully timed emails to customers who have purchased their invisible aligners. These emails are incredibly beneficial for customers wearing invisible aligners. I can attest to this: it’s easy to get busy and forget exactly how long you’ve been wearing a pair. Each time a new email appears, I can’t help but thank them for this small detail. This isn’t just good for me and my fellow teeth-straighteners, of course. These emails reduce the chance of a customer forgetting to switch aligners — or switching too early — and interrupting their treatment. Without these emails, there would be more calls to customer service, more requests for replacement aligners, and probably also some very unhappy dentists. Another great automation bonus: if something happens during the course of your treatment and you do get off schedule, your reminder email takes you right to a page where you can make corrections. This lets the customer course-correct the automation on their own. 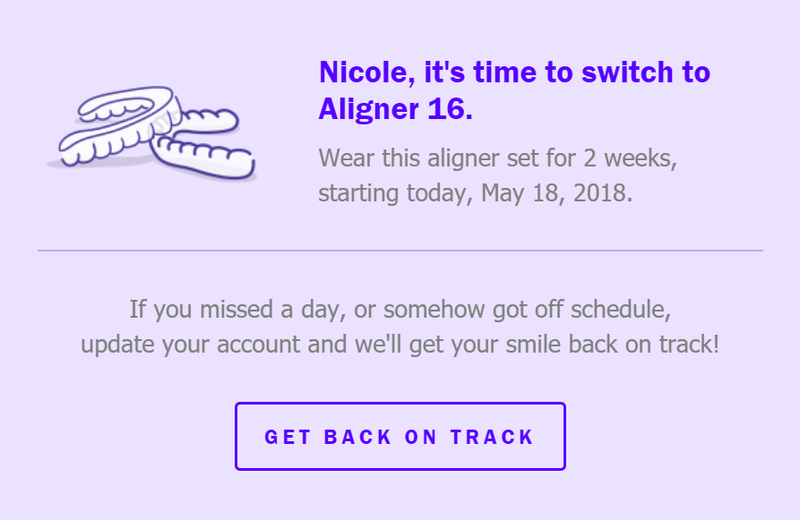 With a new start date for an aligner set, the next reminder won’t come through until two weeks have passed, and you’ll never get off track. 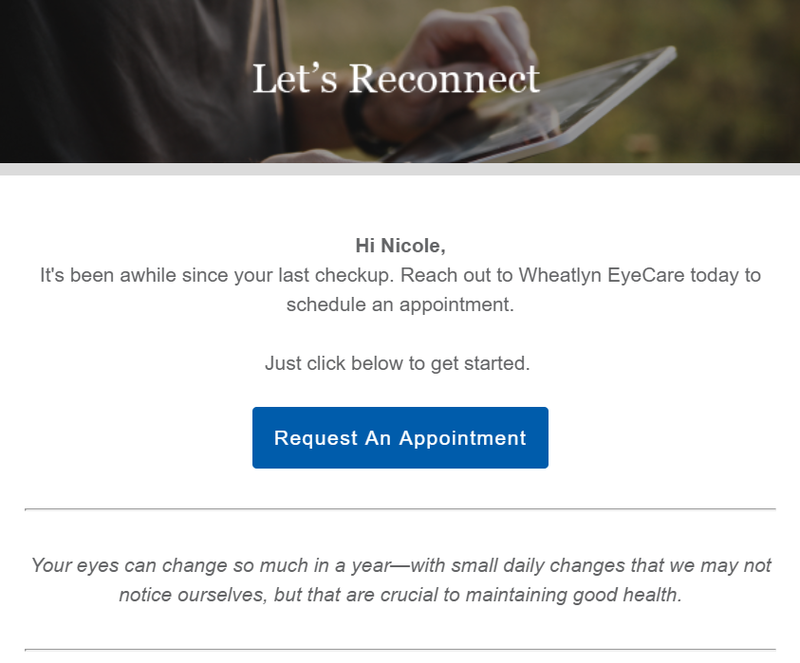 For even further customization, employees at this optometry office might want to check each patient’s insurance to see how often they can get new glasses, contacts, or other items covered by their plan. They can then send schedule automated messages only when they’re eligible for something new — but not too soon. There’s also even simpler options here, like appointment reminders sent via text, that can make you look like you seriously have your act together. Even if all you did was put a customer’s name and time in a database, they’ll appreciate your thoughtfulness. If you have a product or service that requires periodic updates such as this one, these examples offer a good model to follow. Think about sending messages reminding folks when it’s time to make an appointment, buy new filters, replace parts, or extend a warranty. And if you offer any sort of timed reminders, giving the customer the power to delay or reschedule those reminders can keep them dedicated to you, no matter what their schedule currently looks like. If you’re already producing content for your site — documentation, guides, blog posts, videos, etc. — sending it to your customers after they convert can reduce stress while helping them make the most of their new purchase without any additional work needed on your part. These “pro tips” aren’t just entertaining — they’re actually useful. They can help customers avoid feeling like they wasted money on a product that is too complex for them, or (depending on the item in question) too limited. Any sort of product or service that requires education to use properly could benefit from automation like this. If you already have a lot of content prepared, make use of it! Finally, don’t forget about requests for feedback. They’re easy to automate, they get much needed social proof on your site, and they can also remind customers to contact you about a nagging issue they might have. One practical example: after a user has been signed up for a specific period of time, send them an NPS survey. If they give you a high score (an 8 or above), you can then automate another email asking for a review, because you know they’re most likely to give you positive social proof. However, you may want to treat lightly with automated requests for feedback or reviews. If a customer returns something or has a complaint, you need to have a system in place to take them off a “how did we do?” automation. Don’t be tone-deaf. Asking reviews from folks who gave you 8 or more for NPS is a good way to do that. Ill-timed, fake-cheerful follow-ups like this are just going to rub salt in the wound. Plus you’re probably not going to like what they have to say, either. Obviously, a large part of creating your strategy is going to involve deciding who you want to reach, when to send your messages, and how. But the remaining parts, which are just as important as deciding what to automate in the first place, involve tracking your results and performing A/B tests. Long-term, you should be keeping an eye on how your automations are performing and actively planning ways to potentially improve them. Let’s first review what you should be doing as far as tracking and analytics are concerned. The automation platform(s) you use will obviously have some analytics or performance tracking built in, but don’t just look at your reports and get mislead by positive numbers. 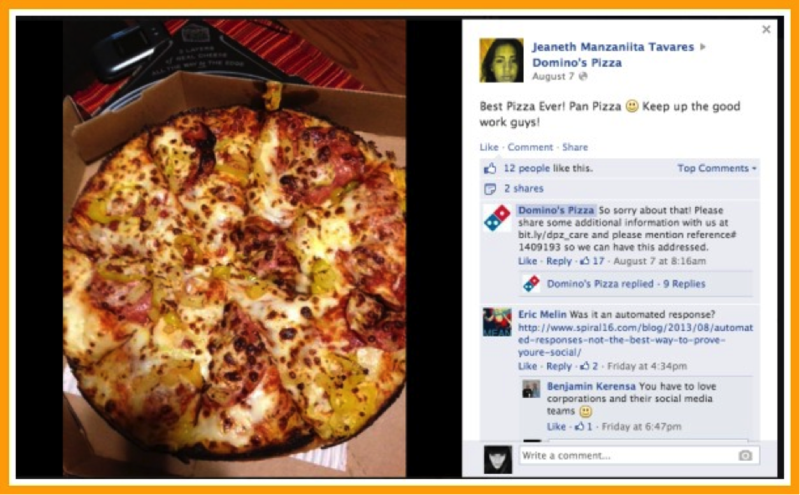 Are leads or customers engaging with your messages? 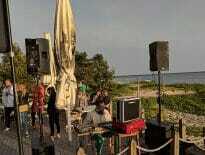 What’s being opened? What’s being acted on? Are the calls to action actually being acted on? Are messages being delivered at the right time? If you’re sending reminders, are they being delivered in enough time to be acted on? Is your post-purchase education arriving early enough to prevent messages to customer service? What’s working well? Is directing users to your content increasing sales or decreasing your refund rate? Use successful automation as a model for future tests and campaigns. What’s not working? 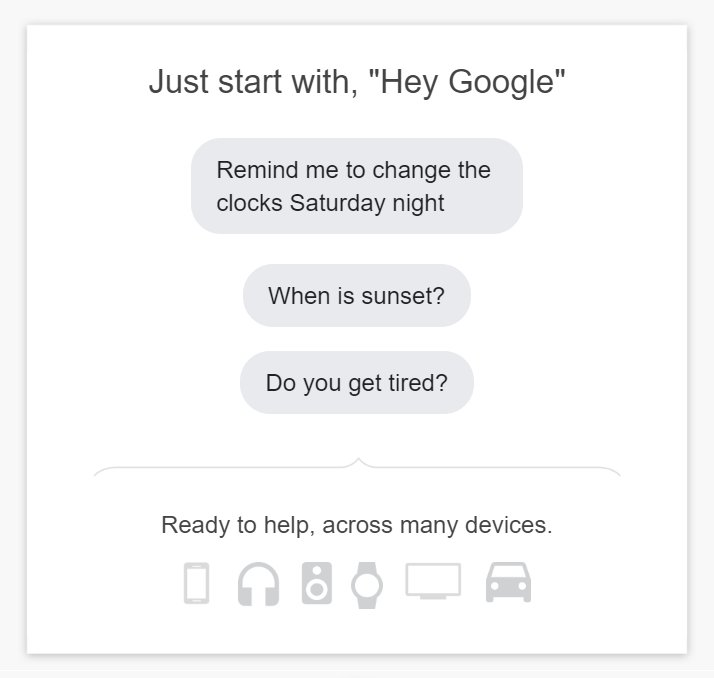 Has anyone complained about a message’s timing? Are unsubscribe rates on the rise? Is your support team now doing more work instead of less? Dig in deep and look for opportunities to improve. Again, these are questions you should ask yourself about every automation you start running. Don’t be misguided by a flood of new clicks or revenue that wasn’t there before — there are always opportunities to improve. Once you’ve identified a potential opportunity — a lackluster response rate, an issue for your support team — the best approach you can take is A/B testing a new version against the original. Will this test be measurable? You should be testing changes that result in hard data (CTR, sales, response etc). Will this test include big enough changes? Changing a single sentence in the middle of your email copy wouldn’t likely be significant. Changing the timing of a text message or a subject line, however, would potentially have a big impact on the results. Do you have a specific goal? Perhaps the worst thing you can do is start an A/B test intending to see “better results.” What should be better? 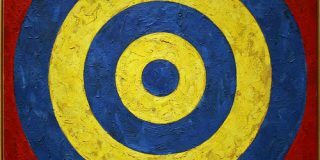 Pick something specific and optimize around it — for example, if you want a higher open rate, focus on testing the subject line, timing, or segmentation. How long will you wait to review and act on the results? You don’t want to act too quickly, but you also don’t want to let the test drag out for weeks — especially if there’s any risk of the test reducing clicks or conversions. Plan on at least an initial review, and ideally schedule some follow-ups prior to the time or point (like number of sends/opens) at which you’ll call it good. Who’s going to be in charge of implementing the changes, if any need to be made? Don’t make the mistake of running tons of tests without planning for implementation. If you identify a huge opportunity but your developer has a month’s backlog in front of them, that’s an issue. Loop everyone in beforehand and consider scheduling implementation in advance if you’re really busy. 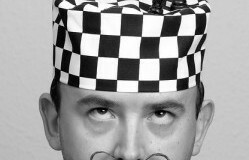 You will probably never finish optimizing your automations, and that’s okay. The goal isn’t to create campaigns that are “successful enough” or “save a little time.” Accept the fact that even automated messaging takes hard work and multiple iterations, and you’ll start to see every weak text message campaign or low-results email as an opportunity. There are a lot of examples of marketing automation in this post, but not all of them will work for you. If your experience with automation is limited, it’s best to develop a strategy that starts small and fills an immediate gap — like cart abandonment or post-purchase emails. If you’re a more experienced user trying to create a comprehensive, all-encompassing strategy across multiple channels, think about how you can better support your customers and internal teams. How could I better supplement my sales funnel? Are you collecting emails from your blog but not doing anything with them? Having customers opt-in for texts but not following up? These are the opportunities you need to jump on — and automate. How could I be supporting my customers and team? This might be by directing customers to educational material after they’ve made a purchase or checking in with them after they’ve had a product for a little while. This might also involve sending reminders to patients or follow-ups to leads so your support team or sales reps aren’t overwhelmed. What don’t I want to automate? Any channels where you may communicate directly with customers should be handled with care. Tread lightly with those Twitter auto-DMs and Facebook chatbots, folks. How am I going to track all this? Part of this will involve the platform(s) you’ve chosen for automation, but you also need to evaluate the results yourself. Decide what you want to look at (specific pages, products, leads…) and what constitutes success. 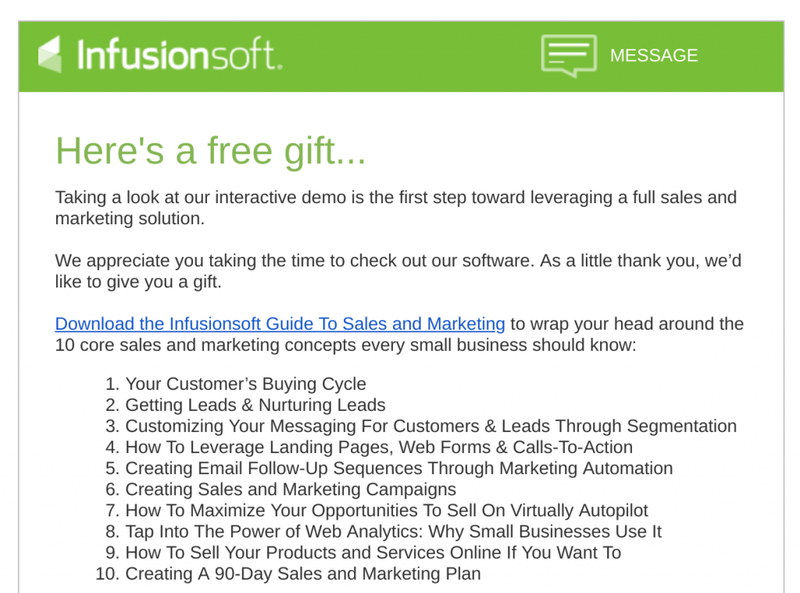 Doing marketing automation is easy. Developing a strategy around it, not so much. But creating your automation strategy all boils down to asking the right questions. As soon as you can confidently say who you want to reach and what you want to provide before, during, and after conversion, you can start fitting the puzzle pieces together. If you have automation in place already, take a look at what you’re sending and how it’s performing. Look for the opportunities to improve — the low CTRs, the poor quality leads — and start there. Consider starting some email drip A/B tests right now. If you’re new to automation, look for the immediate gaps. What have you always wanted to put in place? Messages to your blog subscribers? Post-purchase education? Automated phone calls? Get out and do it. Nicole Kohler is a content strategist at Automattic, where she works on blog posts, landing pages, and the occasional marketing experiment. She is also a public speaker and can often be found talking about content marketing at WordCamps in the eastern US. When she's not at work, you can find her on Twitter or chasing her two dogs around the backyard. One thing that drives me crazy are poorly designed marketing automation emails. Ones that don’t render well on mobile, don’t have any branding or contact information. Just setting up an auto-responder is not enough.